Area 4-8 is the eighth course of Warped Mansion and the thirty-fifth course overall in Mario vs. Donkey Kong: Mini-Land Mayhem!. 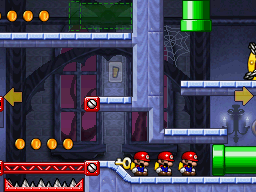 The Mini Marios begin on a platform on the bottom right, with the exit door on the top right. In order to reach it, the Mini Marios must rearrange themselves so that the one with the key is in front, using the Green Pipes and Red Girders to their advantage. The M-Token is located on the bottom right, on top of the Green Pipe near the Mini Marios' starting positions. To collect it, a Mini Mario other than the one with the key must use the Green Pipe entrance just above the exit door. The Mini Mario Card is located near the very center, accessible via the Red Girder platform on the middle level. A Mini Mario must simply use said Red Girder platform to reach it. In Plus Mode, the Mini Mario must be guided to the exit door first, followed by the Mini Toad and then the Mini Pauline. This page was last edited on September 18, 2018, at 04:04.